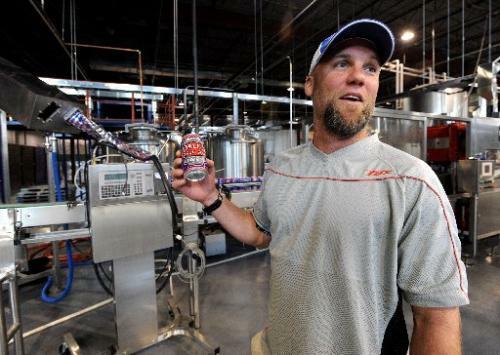 The Cure for What Ale’s You: Craft beer canner and 1992 Auburn graduate Dale Katechis ales it up at the Oskar Blues Brewery’s Longmont, Colo. facility in 2008. The Auburn Spirit is the spirit of the underdog. So the success of Dale’s Pale Ale (the New York Times called it the Top American Pale Ale) comes as little surprise:The recipe was perfected in the bathtub of a trailer off Wire Road. During that five years, Katechis bartended at Darnell’s, “that hippie bar across from Toomer’s Corner.” After graduating from Auburn with a degree in finance, he moved to Colorado. And according to Katechis, its recipe remains virtually untouched since the days he was bathing regularly in Auburn. It’s also one of the best-selling craft beers in the country, which might have something do to with Dale’s revolutionary idea in 2002 of putting his tub ale in a can. Then they started ripping it off; according to the Brewers Associations, now more than 100 craft brewers offer their beers in cans. Katechis has a history of going against the odds. There was no home brewing scene during Dale’s days in Auburn, no brew clubs lobbying to legalize the hobby. Twenty years later, Dale is selling his old homebrew through 80 distributors in Colorado and across the south and the coasts. 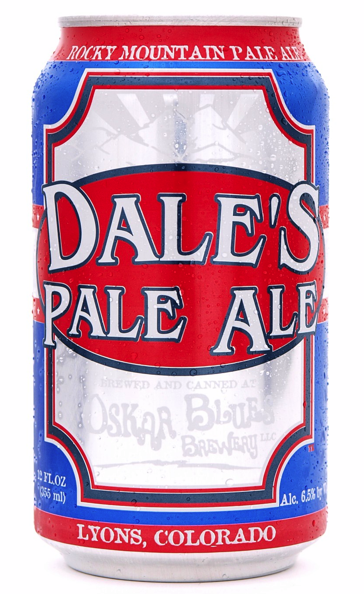 You can find Dale’s Pale Ale in BevMo. You can find Dale’s Pale Ale in Whole Foods. Auburn alumni in and around Boulder, Colo., just 15 minutes from Lyons, can usually find it flowing at alumni club meetings. Related: Auburn Brew Club wins bet, quaffs case of Oregon homebrew. I first had a Dale’s Pale Ale on the Friday night after the National Championship. I was stuck in a Holiday Inn in Denver after a delay in LAX caused me to miss my connection back to Huntsville. It was served to me by an Auburn native who gave me a big “War Eagle” right as I sat down at the bar attached to the hotel. What had been a very trying week (I had flown from Phoenix to LA for work on Tuesday after the game), and an even worse day (I hadn’t been home in nearly a week) finally got better. Oh, and since it was late on a Friday night, the bartender had put the Championship Replay on the biggest TV in the place. Holy moley!! One of my favorite beers in the world is Oskar Blues’ Old Chubb. I always try to have it on hand. Fantastic Scottish heavy. In fact, I have a few in my fridge right now ready to go down the hatch tonight, but now I’ll say “War Eagle” after cracking the can. Auburn spirit in a can! One can only imagine how many things – and children – have been conceived in a bathtub in a trailer off Wire Road. That’s really neat to know the back story – I was turned on to Dale’s earlier this summer from a friend and have to say it is fantastic. I had developed a bit of beer snobbery over the last few years and would never have tried it (even though I like the can’s coloring, etc.) because it was in a can – at a friend’s urging this summer, I gave the brew a try and have been a big fan, and have drank many sixers, ever since. Darnells was the spot to get some great beer. Remember the Around the World tour you could do. But I would technically call it a hippie bar. I remember Mr. Resistor, Follow For Now, Southern Culture on the Skids, Plaid Camels, playing along with the Nothing Personals of the scene. I live in Colorado and definitely appreciate the southern hospitality of Oskar Blues. Great food and beer. Great read! I’m glad you followed up with him. I’d like to say I remember him from Darnell’s, but it’s all a beery haze. Tried this beer 2 years ago in Atlanta and loved it. Now I have even more reason to buy it by the case to bring back to Alabama….unless someone knows where it’s available here. Mark, it looks like Columbus is the closest locale (according to the Oskar Blues beer finder). I drank more than a few of those beers while in Vail this summer. Damn fine brew. War Eagle! I prefer the cans because, in an area where you can walk the streets with a beer in your hand, you can’t carry glass. Plus a can fits in my favorite coozie. Good news – found Dale’s Pale Ale and other Oskar Blues sixers at Frisky Whiskey exit 2 in West Point, GA! Universities and their beer makers. Great group and great beer. Four years ago when the Democratic National Convention was in Denver the Auburn connection paid off for the Alabama Democratic Party’s hospitality storefront in downtown Denver, Sweet Home AlObama. Dale and his brother helped make our hospitality area the hit of the convention and of course Dale’s Pale Ale was the official beer of Sweet Home. Their presences helped to remind many there of what passage of a Free the Hops bill would mean to Alabama. Today we are now seeing the positive effects of that bill. It wasn’t a political endorsement, but more of an Auburn and State of Alabama connection. Thanks again guys and War Eagle!